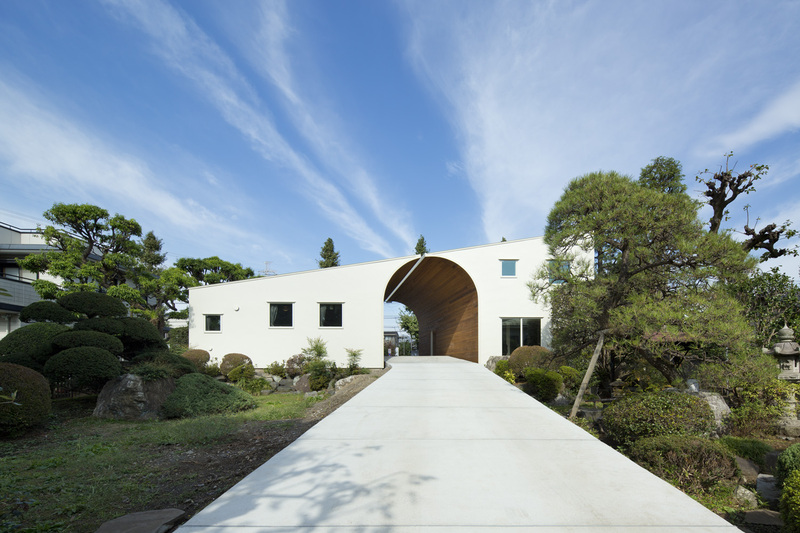 A pair of houses stand on the sides of a slope, stretching walls over the slope in between in arch shape. The house on the left is a one-story building (A) for a woman living alone, and on the right is a two-story building (B) for a couple + child household. Three generations are living in the pair of houses, grandmother (A), daughter’s couple and grandchild (B). The vast premises of more than 1000 sq had a former main residence with a guest house, a small torii shrine gate and a small shinto shrine, Japanese traditional tea garden with delicately pruned trees. South of the premises faces a local street and north faces former national route. The building A and B are built where the main residence was dismantled, and the slope in between was extended from Japanese garden to make a path between the south and north sides of the premises. The rest features were preserved as much as possible, as it was considered better not to make drastic changes on the premises which was semi-public and open to the community for a long time, allowing access from the neighbors on the east and west sides and local street. As cars are the principal means of transportation, the slope in between building A and B serves as a driveway for daily convenience. Building A provides barrier free access to inside the building whose floor level is set to give more than 2 meters in height from the ground level to the windows for security purposes. Former national route has heavy traffic, thus building A and B do not have windows on the north. Windows facing the neighbors on the east and west sides are small and minimized, whereas the windows facing the garden are large. Both building A and B have courtyard and skylight with slanted ceiling and curved walls to give varied interior scenes. The courtyard has the largest daylight windows to provide light through transom windows and slanted ceiling. Daylight from skylight is reflected on ceramic tiles on the curved walls to give different effects by the time and weather; when sunny, it is sharp, when cloudy, it is soft, and in the morning and evening, pale violet blue light spreads inside. The edges of curved exterior walls stretching from both sides of the slope are slightly apart, not making building A and B a two-family home from legal perspective. However, these buildings, while they are independent, stand face to face and side by side to share everyday life and space.